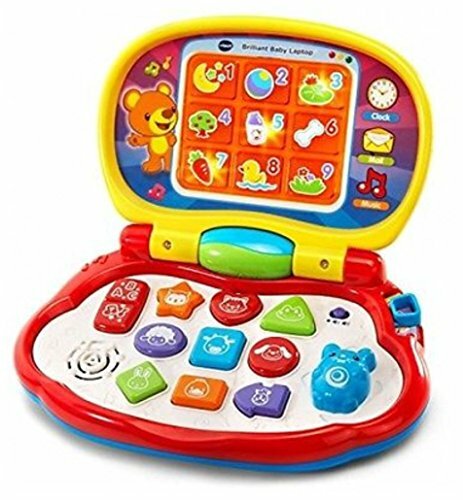 Explore and learn with the Brilliant Baby Laptop by VTech. This travel-ready toy laptop features nine brightly colored shape buttons and a movable mouse that interact with the light-up screen. Choose animal mode to learn about animals and their sounds; shape mode to explore colors and shapes; or music mode to hear a variety of songs, melodies and short tunes. Close the laptop, and it's ready for on-the-go fun with a chunky carrying handle. Learning fun is a click away! Requires 2 AA batteries (batteries included for demo purposes only; new batteries recommended for regular use). Intended for ages 6 months to 3 years.